Costco sells more wine in the USA than any other retailer. It’s not in the same league in the UK, but it does now get a share of my wine buying budget. On our latest shopping trip I wanted to stock up on Raven’s Wood Californian Zinfandel because it’s a reliable hit with gusts, but to my horror they were out of stock. That is a little frustration with Costco, they buy in bulk, but if they don’t get the price they want, they don’t buy at all, so something you thought would be on the shelves and easy to pick up may just disappear for a few months, or forever if the price isn’t right. Thrown into a retail panic I shopped around and bought a few different bottles of red. I focused on the Kirkland (Costco own brand) and Californian choices as I figured that’s what Costco would do best. This Stag’s Leap Cabernet Sauvignon bottle has a rather utilitarian look to it, stopping just short of a “Tesco Value” look. 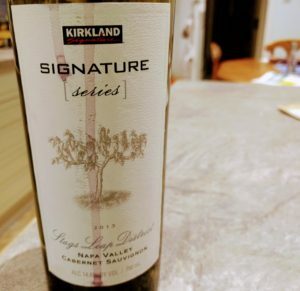 Kirkland Signature Stag’s Leap District Cabernet Sauvignon ’13 itself looks rich and dark red, with colourful legs. It smelled alternately of oaky vanilla, a bit of tobacco and lots of blackcurrants. It’s dry, with a medium acidity and firm to ripe smooth tannins. It’s at the upper end of medium bodied and at the high end for alcohol. 14.5% does give it quite a hit, but the fruit can carry it through and the tannins do seem to balance it out so there’s a warm smooth mouth feel rather than an alcohol burn. It tastes fruity, but again, with a coolness, the fruit is blackcurrant and plum with even a little red cherry, sprinkled with vanilla sugar rather than baked or boiled. There’s some dried fruit flavour too, more prune than raisin, yet still quite plump. Following on there’s a bit of coffee and chocolate taking over from the tobacco I thought I smelled at first. As a kid I loved those little liqueur cherries you used to get, dipped in dark chocolate to keep them moist and stable. My Mum was a nurse, so every Christmas all sorts of chocolates and sweets arrived at home from grateful, usually geriatric, patients. We were quite the little connoisseurs of candy. My preference was for Black Magic, Terry’s All Gold, liqueur chocolates and the marvelously weird New Berry Fruits (which I just checked do still exist), luckily I had siblings who preferred milk chocolates and nasty fondant creams. Whilst this wine isn’t an exact replacement for liqueur cherry chocolates, it’s not a bad interpretation of them in wine. My guess is this wine could happily have another year or two in the bottle, but maybe more “manly” flavours like the tobacco and wood would take over from the festive joy of the chocolate cherries, so I’m going to drink it now.